Is your hair dry, coarse, curly? And do you find it difficult to tame those unruly strands? Whatever the reason may be – washing too often, using harsh soap and heated styling tools, excessive chemical treatments, or genetic (blame your parents :-)) – dry hair basically lacks moisture. Although hair is mostly protein, moisture is still vital for your hair. And without sufficient moisture your hair will be dry (of course), feel hard and rough, difficult to comb, break off easily, and may take forever to style. So put the moisture back into your hair. The best way to do it is – naturally, using the goodness of hair nourishing herbs; these will not just add moisture back into your hair, but also increase manageability and restore shine and luster. Natuve to Europe, Western Asian and North Africa, Marshmallow has amazing healing and moisturising benefits. The entire plant, particularly the root is rich in mucilage which helps to soften the hair naturally while providing easy slip when combing. With regular use you will notice that your hair is more flexible and less prone to frizz and flyaways. Due to its soothing and cooling properties, marshmallow is extremely effective to combat itchy, irritated scalp conditions. Marshmallow also provides natural proteins for the nourishment and health of hair, and makes hair grow faster, thicker and shinier. Works best for: very dry and damaged hair, and sensitive scalp. It provides amazing slippery texture for easy detangling. Random fact: Marshmallow candies were originally made from candied root, but now they only contain sugar, flour and gum. 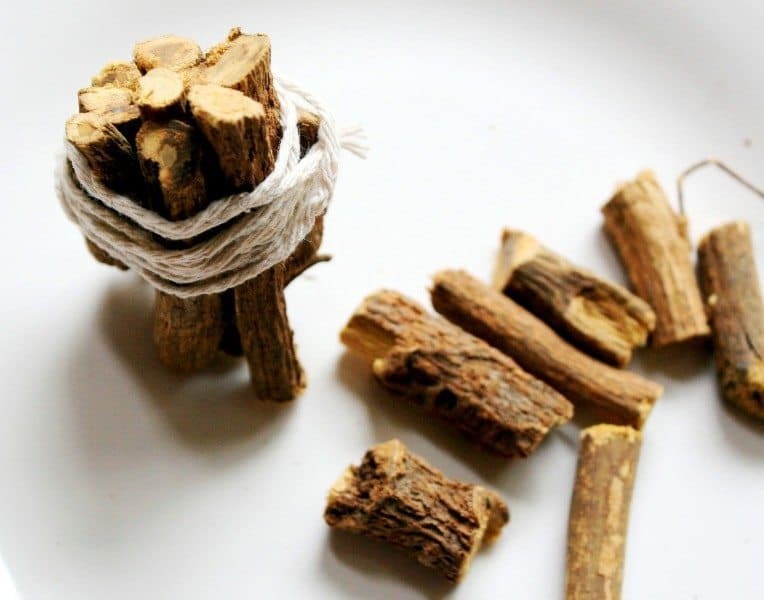 Licorice, locally known as mulethi or jethimadhu, has been traditionally known and used as medicine in Ayurveda for rejuvenation. The amino acids and polysaccharides in licorice root help to keep the scalp moist and hydrated. They also strengthen the hair shaft and provide natural shine to your hair. Licorice has a weak anti-androgen effects and is often used in products to help with hair loss. It’s also highly beneficial in skin ailments like eczema and psoriasis due to its wonderful healing features – anti-inflammatory, anti-allergic, anti-viral and analgesic. These delicate, creamy-white flowers are more than just a pretty scent. It moisturises, conditions, and hydrates dry, damaged hair, plus they also have hair-softening benefits. Infusion made from Elder flower helps seal the cuticles, thereby improving shine and manageability. Rich in flavonoids, sterols, and fatty acids, these flowers help to soothe dry, irritated scalp, treat acne, blemishes, rashes, and improve complexion. Works best for: normal – dry scalp and hair. Random fact: The elder tree has so many medical uses that it was traditionally known as ‘the poor man’s pharmacy’, providing a cheap cure for all ills. The flowers, berries, leaves, and occasionally the bark are used. Parsley is so chock-full of nutrients, which I didn’t know until recently. It contains a high amounts of vitamin A, C, K, silica, iron, calcium, and flavonoids – each of these nutrients is important for healthy hair growth. 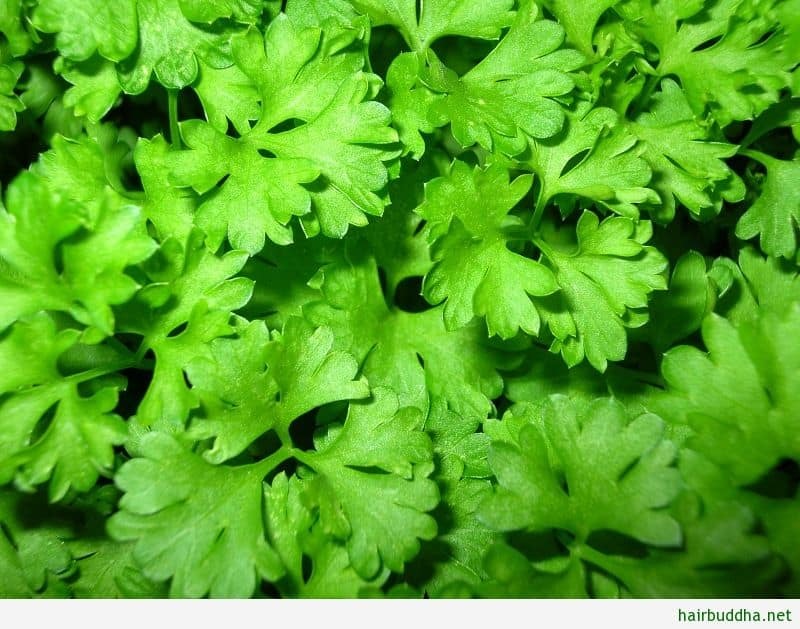 An excellent conditioner, parsley adds deep moisture to dry-brittle hair to create smooth texture. The silica and flavonoids in parsley help soothe irritated scalp conditions like dandruff, decrease breakage and add luster to dull hair. Also, it is said to stimulate hair growth and help eliminate head lice. Works best for: normal – dry scalp and hair. It adds body and luster to your hair. Native to Europe and western Asia, Comfrey is another great herb for dry hair. Like marshmallow, comfrey root too is rich in mucilage which helps detangle hair – so not only will it be easier to comb, but you’ll also have less breakage from tangles and knots. Comfrey infusion, made from root or leaves, restores moisture and makes hair soft as silk. Plus, the allantoin in the comfrey offers wonderful soothing and softening benefits to dry scalp, and aids in the regeneration of new skin cells. Works best for: normal – dry hair, soothes irritated scalp. It makes hair silky soft. You can also add your favourite herb to DIY hair mask. Or for extra conditioning add them to homemade hair cleanser. I buy mine from amazon. But you should be able to find them in health food store. Or look up in the tea section of your grocery store.